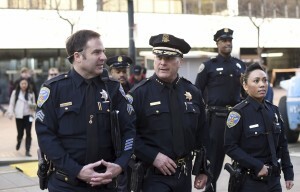 Federal investigators will take an in-depth look into the use-of-force policies deployed by San Francisco’s police officers, the Justice Department announced Monday. The department said its Office of Community Oriented Policing Services, or COPS, will conduct an “independent and comprehensive review” of the San Francisco Police Department’s policing practices, two months after five officers shot and killed 26-year-old Mario Woods, a black man, in the city’s Bayview District. “In the days and months ahead, we will examine the San Francisco Police Department’s current operational policies, training practices, and accountability systems, and help identify key areas for improvement going forward,” Attorney General Loretta Lynch said in a statement. Unlike the department’s previous high-profile probes into Cleveland, Chicago and Ferguson, Missouri, the Civil Rights Division is not involved with the case in San Francisco. That means the review won’t end with a court-monitored legal settlement like in Ferguson, the Associated Press reported. Rather, it’s voluntary, said Brian Stretch, acting U.S. Attorney for the Northern District of California, at a news conference Monday. The review will be collaborative approach involving the city’s police chief and mayor to help make recommendations on how to reform the department’s policing procedures. “It is not enforced in a court of law, but it is absolutely enforced in a court of public opinion, which can be just as powerful as a court of law,” Stretch is quoted as saying. COPS head Ronald Davis said the whole process can take up to two years, SFGate reported, including eight to 10 months for an initial assessment. Bystander videos of the December 2015 fatal shooting were quickly uploaded to social media accounts like Instagram. Then, San Francisco Police Chief Greg Suhr said Woods had matched the description of a suspect who had stabbed a stranger less than an hour before his confrontation with police. Suhr also said refused to drop a kitchen knife after officers used lead-filled beanbags and pepper spray to subdue Woods. Suhr said the five officers opened fire on Woods after he had made a move toward them. “We will not stop. We won’t stop,” Jones said. “We cannot stop until justice rains down on our communities,” Phelicia Jones of the Justice 4 Mario Woods Coalition told SFGate.